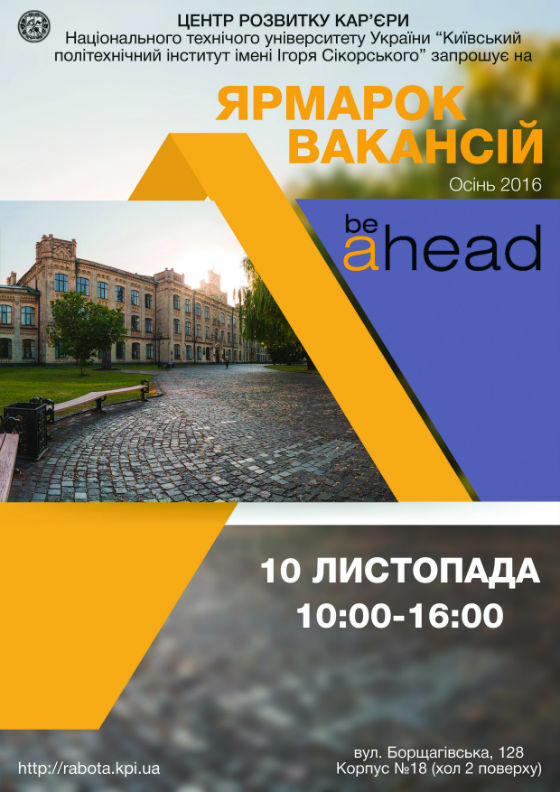 Job fair "beAhead". Autumn 2016" was hold in building №18 of NTUU "Igor Sikorsky KPI" on 10 November. 39 companies and a few thousand of students took part in it. Business and organizations represented are involved in various fields and have interest in perspective students’ and young specialists’ employment. The most of them are well-known and don't need to be introduced again. They are Huawei, Melexis, JTI, SMART business, Procter and Gamble, IBox, EPAM, «Romstal» Ltd., EVO.company, Ubisoft, 1+1 Media, «Coastal Ukraine» Ltd, BRYCEN Co.Ltd., "Parus-Project" Ltd., SPA «ECOSOFT» Ltd, Sigma Software, Burda-Ukraine Media company, Kernel, «Kerher» Ltd. etc. 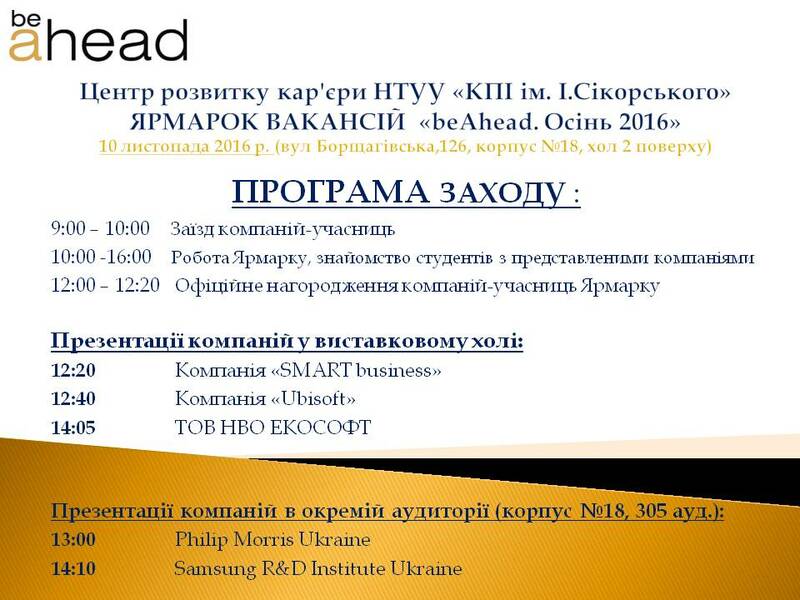 Students and graduates from KPI as well as from other higher educational establishments were able to familiarize themselves with companies operations and get information about vacancies and open employment programs, apprenticeship training as well as attended presentations performed by "SMART business", "Ubisoft", SPA "ECOSOFT" Ltd.
Pro-rector for scientific and pedagogical work, Petro Kyrychok delivered his speech at the official ceremony opening. He noted that this traditional event generates a great interest among both employers and students during many years. Favorable reviews from HR-managers of partner companies mean that KPI graduates show high level of professionalism and creative approaches to problem solving. NTUU "Igor Sikorsky KPI" expressed gratitude to the following trade participants "AZBI" Ltd., "Robota plus" company, "Samsung Electronics" Ltd., "Melexis", "SE CAT CORPORATION" Ltd and others for their participation and support in students' employment and professional career guidance. Certainly, not all visitors have already decided on their future workplace but according to employers and graduates such meetings are very beneficial.